Viruses are generated using standard methods that have been optimized for each specific virus in order to generate high quality preparations. After production, all virus preps are titered and subjected to quality control by Addgene before being distributed to customers. Details about our production protocols, titering methods, and quality control are described below. AAV distributed by Addgene has been produced either in-house by Addgene scientists or through collaboration with viral vector manufacturing facilities, such as the University of Pennsylvania Vector Core. Transfections are performed using the transfer plasmid, a plasmid encoding rep and serotype-specific cap, and a plasmid encoding adenoviral helper sequences. AAV preparations are purified by iodixanol gradient ultracentrifugation or cesium chloride gradient ultracentrifugation and concentrated to purity and titers adequate for in vivo studies. Preparations are then aliquoted and stored at -80°C. Titering is either performed by Addgene or by the University of Pennsylvania Vector Core. In general, titering is performed by the facility that produced the viral vector lot. Contact us to determine which facility produced your viral vector lot. 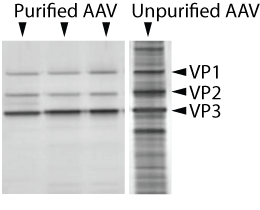 At Addgene, AAV particles are titered by real-time quantitative PCR using primers targeting the ITR. The amplicons are detected using SYBR green technology. Titer values are then determined by comparison to a standard curve of a plasmid sample of known concentration. The qPCR assay and corresponding titer determinations are also validated using AAV Reference Material (ATCC). Titering by the University of Pennsylvania Vector Core (Penn Vector Core) is (as of April 2016) determined by droplet digital PCR (ddPCR). Previous experience by the Penn Vector Core suggests that titers obtained using ddPCR are generally 3 fold higher than those achieved using the standard qPCR method. However, ddPCR titers reported by the Penn Vector Core are comparable to qPCR titers reported by Addgene. Addgene ensures high quality viral vectors by optimizing and standardizing production protocols and performing rigorous quality control (QC). The specific QC experiments performed varies for each viral lot. To learn which specific QC experiments were performed on your lot, please contact us. Next-generation sequencing is performed on viral genomes isolated from the final AAV preparation. Sequencing results are analyzed to confirm the identity and integrity of the viral genome and the absence of unexpected DNA contaminants. Endotoxin contamination in vector preparations can alter the immunogenic properties of the final product, particularly in large animal studies. Endotoxin contamination is minimized by using an endotoxin-free plasmid purification protocol. To minimize the immunogenic properties of the final vector preparation, the quantity of gram-negative bacterial endotoxin is ensured to be less than 5 endotoxin units per mL. The endotoxin assay is carried out using the Limulus Amebocyte Lysate (LAL) gel-clot method. Purity of AAV preparations is assayed by comparing the relative stoichiometric ratios of the viral capsid proteins VP1, VP2 and VP3. Samples of viral preparations are subjected to polyacrylamide gel electrophoresis (PAGE) followed by silver staining or SYPRO Red staining and the molecular weight and relative intensity of the viral capsid proteins are analyzed. The abundance of viral capsid proteins as a fraction of total protein present in the sample is also determined and used to determine purity of the AAV preparation. and VP3 are shown relative to the total protein present in the sample. Viral vector preparations are added to cells in culture. Three to five days later, cell cultures are inspected for sterility. Some viral vectors are tested in vitro and in vivo for gene expression and/or function. These data are sometimes reported or posted on the material page for the corresponding catalog item (see maps section for images). AAV Pro cells were transduced with either pAAV-Ef1a-mCherry-IRES-Cre (55634-AAVrg) alone at 1.7E6 viral genomes (vg)/cell, pAAV-CAG-FLEX-rc [Jaws-KGC-GFP-ER2] (Addgene 84445-AAVrg) alone at 1.1E6 vg/mL, or both. 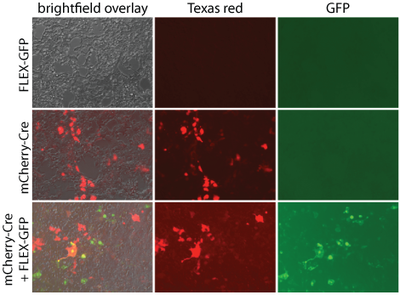 Two days later, Cre-dependent GFP expression was detected with direct fluorescence. GFP was not detected in the absence of Cre. mCherry expression alone was detected. pAAV-Ef1a-mCherry-IRES-Cre was a gift from Karl Deisseroth (Addgene viral prep # 55632-AAVrg). pAAV-CAG-FLEX-rc [Jaws-KGC-GFP-ER2] was a gift from Edward Boyden (Addgene viral prep # 84445-AAVrg). 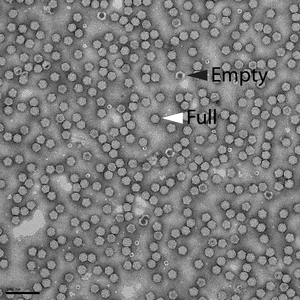 The ratio of empty to full (i.e., genome containing) AAV particles within representative vector preparations was quantified with electron microscopy after negative staining. Empty vector particles can be identified after negative staining and appear darker than full vector particles. full particles (white arrowhead) relative to empty particles (black arrowhead). Scale bar = 100 nm. Browse AAV preps available from Addgene. After receiving your virus from Addgene, read our detailed recipient instructions for next steps. Plan an experiment using our virus protocols. Browse our AAV vectors collection. Lentiviral preparations are produced in a 293T cell line using the 2nd generation psPAX2 and pMD2.G packaging system developed by the Trono lab. Cell culture medium (OptiPro SFM) containing lentivirus is first cleared by low speed centrifugation and then by filtration through a 0.45 µm polyethersulfone membrane. The preparations are then aliquoted, snap frozen in liquid nitrogen, and stored at -80°C. All titering is performed on lentiviral preparations that have been stored at -80°C and thawed. This ensures that any loss of titer associated with the recipient's initial thaw will be accounted for in our reported titers. Lentiviral vectors carrying selectable markers are titered using the standard colony formation assay. Briefly, 293T cells are transduced with serial dilutions of a lentiviral vector, exposed to antibiotic, and resistant colonies are allowed to expand for 2 weeks. Culture dishes are then stained and macroscopic colonies are counted to determine infectious titer. The 293T and A549 lines are routinely tested for mycoplasma contamination using the protocols described by Uphoff and Drexler (PubMed: PMID 23179822). Lines are maintained for 15 passages before being discarded and replaced with a new vial of early passage cells. Approximately 2-3 weeks post-thaw, cell culture supernatant is tested for mycoplasma contamination. To date, Addgene has never had a case of mycoplasma contamination. In the event of contamination, all of the virus produced in the line will be taken off-line and discarded. Addgene uses a rigorous barcode matching system that follows the sample from the DNA tube all the way to the cleared viral preparation pool. The majority of our lentiviral vectors are titered using the colony formation assay. This assay involves transducing cells with serial dilutions of a lentiviral vector, and allowing antibiotic-resistant colonies to expand for 2 weeks. During this long-term cultivation, cells are routinely checked for signs of microbial contamination. When possible, all plasmids used for viral production are propagated in the endA-mutated NEB Stable strain of E. coli. In addition, plasmids are typically prepared using endotoxin-free plasmid purification kits. Browse our plasmid collection of popular lentiviral vectors.